In a bid to break the long standing deadlock over the proposed India-European Union (EU) free trade agreement, Chief Negotiators from both sides will meet in New Delhi next month, EU ambassador to India Tomasz Kozlowski has said. His remarks come in the backdrop of a long pause in negotiations between the two sides owing to differences on crucial issues such as intellectual property rights, duty cut on automobile and spirits, among others. �We want the concluding of a broad and comprehensive FTA. It has to be a win-win situation,� the EU envoy said. �The chief negotiators will meet here soon, in mid-November. European Union wants to move this forward and I�m rather optimistic,� he said. He said the EU is the biggest trading partner for India and the proposed pact will be beneficial for both sides. He was speaking at a session on �India-EU Relations: Can it be a factor of stability in an Uncertain World?� at the India International Centre here last week. The 14th India-EU Summit was held in New Delhi on October 6, during which the two sides held extensive deliberations on bilateral, regional and international issues, including the Rohingya crisis and the volatile situation in the Korean peninsula. However, there was no major headway on the much-delayed FTA at Prime Minister Narendra Modi�s meeting with the European Council president Donald Franciszek Tusk and European Commission president Jean-Claude Juncker. India and the EU have been strategic partners since 2004. The 13th India-EU Summit was held in Brussels on March 30 last year during Modi�s visit. The last year�s summit meeting had also failed to make any headway on the resumption of the long-stalled negotiations for an FTA. 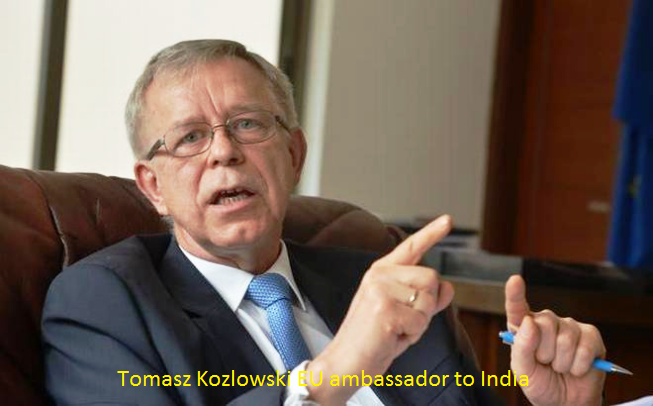 Kozlowski also asserted the EU was a �credible, predictable, and reliable partner� of India in all fields of cooperation.